This SkyDancers.com eighteen inch diameter Sky Dancer® blower is the perfect mix of power, quality, and dependability. SkyDancers.com has sold thousands of these tried and true sky dancer blowers, so the product is battle proven. This blower fits all brands of 18" diameter Sky Dancer attachments. The 4 lockable roller wheels that come standard with this unit make this 43 pound blower easy to move and set up anywhere. Not intended for use in wet, rainy, or damp conditions. Shipping Dimensions: 23" x 21" x 18"
US patent (#6,186,857) utilizing the Dynamic Inflatable Technology, is strictly enforced. All SkyDancers.com brand blowers are covered by the 1 year, limited warranty (from the date of purchase). Warranty only covers SkyDancers.com considered product defect. 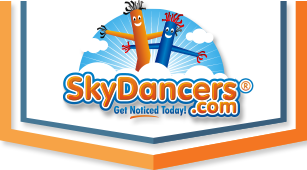 SkyDancers.com reserves the final right to grant warranty approval. User is responsible for all warranty return shipping. Cases will not be approved for misuse, neglect, water damage or user error. Approved warranty cases will be issued a replacement unit.